DAZ 3D provides content as self-extracting installers with license agreements. The current format at the time of this article is the Bit Rock format. Previous formats include various versions of VISE installers. This article explains how to install DAZ 3D content into Poser for use in Poser. Screen shots reference Bit Rock installers. Earlier installers look different but have similar options. The content installer when used correctly will place all the files in their correct hierarchy into the runtime for use in Poser's Library Panel. Users with further questions about how Poser handles and displays content are encouraged to contact Smith Micro for Poser support. 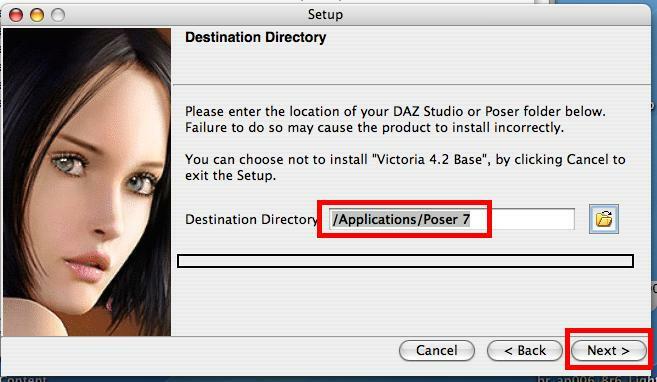 In this example below, the user is installing into Poser 7 on the Mac. Notice that 'Poser 7' is the last folder in the path. The executable file for Poser has changed through its versions. For this reason, the content installer won't recognize later versions of Poser. Here's how to get around this. Choose “DAZ Studio” as the target application. Don't worry. We haven't forgotten you're using Poser. On the next screen, choose to “Specify” the path. On the next screen, use the browse button. Browse to and select the correct target folder. The previous section explains which target folder to use. You're not using the 'runtime' folder as the target folder, are you? That won't work with DAZ 3D content. Starting with Poser 8 and higher, the default 'runtime' folder no longer automatically appears in your Library Panel. If you've installed content to show up in the runtime folder as shown above, you'll need to add the runtime folder to the Library Panel. If like many users, you are installing into Poser 7 or higher, you'll need to use this work-around. At the beginning of the installation, choose 'DAZ Studio' as the target application. Then choose to 'Specify' the target folder. Click 'Browse' and choose the correct folder as shown above. Proceed with the installation. In order to find the content you've installed, please see the readme. You can see the readme either at the end of installation or by browsing to the readmes folder next to the runtime folder. The readme for the product will give the name of the top level and then sub folder for the product. For example, the readme for Victoria 4.2 base refers to “FIGURES –> DAZ People.” This means you need to look in the FIGURES folder and then within it for the DAZ People folder. If the product does not have a readme, please contact DAZ Tech Support. * Choose a single target folder for DAZ 3D content. Multiple paths will unnecessarily complicate your configuration. You can either use an existing folder or create a new one. The following items explain how to choose the folder properly. * The target folder must be *outside* of the Program Files folder (includes Program Files (x86)), if you are using Windows Vista or Windows 7. * The DAZ 3D content installer needs to target the folder holding the runtime. This is a really basic principle that cannot be avoided. For example, if you choose to create a folder called 'content' and target it with the DAZ 3D installer, you will find a folder inside of it called 'runtime.' You can then add this 'runtime' folder in your Library Panel in Poser. This is different from other content manufacturers. To repeat, DAZ 3D content installers must be directed to the folder *holding* the runtime. If you target the runtime folder itself, the files will *not* be created in the correct hierarchy and the content will not work. As you can see above, the 'content' folder is holding the 'runtime' folder. I could have called the 'content' 'my content' instead. It doesn't matter. The principle works the same way. * You must never use the 'runtime' folder as the target folder when you install DAZ 3D content. * Do not target the 'downloads' folder that is inside of Poser. Since the DAZ Content installer creates or uses the existing 'runtime' folder inside the target folder, you can never expect DAZ 3D content to be found in the 'downloads' folder. If you use target the 'Downloads' folder, the files will *not* be created in the right hierarchy and will not work correctly Poser. Do not install DAZ 3D content to the 'Downloads' folder. You may not have the full above path if you have not actually installed DAZ Studio 4. You don't need to install DAZ Studio 4, in this case, you can simply create the above folder hierarchy directly on your hard drive and then use 'My Library' as the target folder.